I hadn’t really thought about importing from CSV, until now. The importer included with bbPress is setup to only import from a MySQL database. We could create a guide to create a simple to database that you could import your CSV into and then bbPress import from that. Either of the ways above should be rather straight forward and I might take a look at few of those importers and fork one specifically for importing from CSV to bbPress in the future. I would sure support this. I’m a newbie to WP and would like to use bbPress, but have a lot of old hypercard forum posts I’ve reduced to a Filemaker database. 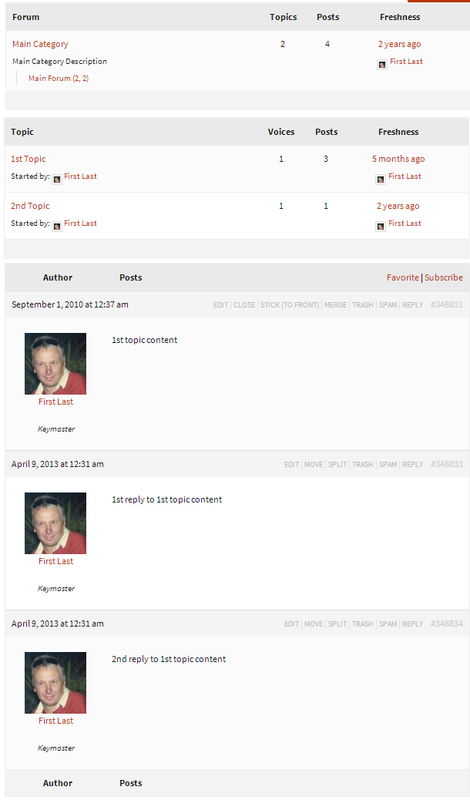 I have about 7 named forums, have authors and their post in date order. None need to be linked as replies. There’s tremendously valuable information on family histories in this archive that I’d dearly like to remain available for those interested. If I could get these posts to a forum, that would be extremely helpful. I’d highly suggest you take a look at some of these CSV importers that support ‘Custom Post Types’, I have had a quick look at a couple of them the other day and I am quite sure they will work fine to import into bbPress. It is just a matter of finding the one that suits you and your CSV data. Thank you for all the guidance Stephen. I appreciate the help. This is terrific, though I suppose that I have to learn somehow the field names to be mapping my fields to. I’ve not actually installed the bbPress plug-in as yet. Does it work with the regular WP database, so that I import the ‘custom post type’ to a WP install, or does it get imported to bbPress itself. Boy am I dumb;-) But thanks Stephen — your responsiveness if super encouraging. Hi Again, I looked at the plug-ins and it seemed that WP Ultimate CSV Importer would do the job. I tried importing one of their example CSV files. It lets me choose the post type “forum” although I see no way to provide a forum title. It appeared to work with no errors. However, looks like it took each post entry and created a new Forum with it. I see no way to have the posts come in as topics under an existing or new Forum. Is there a way to change this once the import is done? Sorry I am not a PHP person and not familiar with the inner workings of WordPress. Firstly, thanks for looking further into this, it gave me enough info to run a quick test import. Next jump into WP Admin and and open up the WP CSV Tool and select ‘Custom Post’ to import from and select your forum.csv file to upload and click import. Topics is up next and you will notice that it includes the field ‘post_parent’ so this is the forum ID that the topic will be imported into. As we do not know the forum ID you will need to open up the bbPress forums panel in wp-admin. Select the forum you want the topics to be imported and this will take you into the forum edit section, look at the URL in your browser and it should be similar to /wp-admin/post.php?post=348830&action=edit what we want here is the ‘348830’ as that will be the parent forum for each topic imported. Update your topic.csv file with this number as per my sample linked above. The replies section is basically the same as the topics section, you need to get the ID orf each topic ID for each reply and update your reply.csv file for each entry. Thanks so very very much, Stephen. I hope that others in the future can find this very helpful guidance for custom importing since it’s so much clearer than the advice I’d seen elsewhere. I will give it a go and post any observations I may have from the experience. One other question, Stephen. As I think through this, don’t I also somehow need to be concerned about getting my authors and perhaps their email addresses registered as members of the site or something? I’d imagine that that would need to be done first. Interestingly, as I look at the file data I have, the identified “author” sometimes has taken new names, and of course email addresses probably require updating. Do I need to assign passwords or something? I hope not, though I expect this depends on how I will choose to configure or reconfigure permissions for posting at the website? Again, thanks a million for any help. Ahhh… Yes… That would make sense, probably a dedicated ‘User CSV Import’ plugin eg. https://wordpress.org/plugins/search.php?q=csv+user plugin that matches your requirements. You shouldn’t have to assign passwords, users can do this themselves later. Once you have your users you will want to update your topic.csv & reply.csv files with the new user ID’s. I have a follow up question on the above topic. In the old BB we had each topic showed with a short summary field of the post content (usually just the first X characters of the content). Is there a way to do that with bbPress Forum topics? I do not see any existing widget that does this. In fact, is there even a field mapping for such a thing? Oops, forgot another item. I want to bring in topic tags as well. How do I do that. For example, when I go to the support forums for bbPress I see a widget on the left that lists links for tags that have appeared in the forums/posts. How would get that? Sorry about the multiple messages. In WordPress terms this is known as ‘the_excerpt’ and is a function that will only show ‘x’ words of a post, this is not something you can transfer, it is a ‘display’ function in WordPress. These are a little tricky mainly because understanding how they are implemented in WordPress is not an easy task as they are distributed throughout three tables. Hi, the import went reasonably well for me. Thanks for all the guidance. I imported values for the “excerpt” field for each topic under a forum post. They do not seem to show up yet in the forum view. What can I do to have them display along with the topic titles in the view listing? You won’t need this text and/or value that you imported. Sorry to hijack this thread @harpeml but this might just be what I’m looking for. @netweb – We are in the process of migrating a Ning site to a bbPress forum. We managed to import some of the content using the ‘Import from Ning’ plugin but unfortunately it didn’t import any replies (just the main topics were imported). From what I can see, it might be possible to convert the json file (which is exported from Ning) to a CSV file and then import that in the way you have suggested above. Do you think this would work? It appears Ning don’t make it particularly easy to get content to other platforms! Indeed this would work converting the JSON to a CSV but I’d suggest another route first if you haven’t tried it. There is a long discussion on the Ning Importer support forum here that should help you get the Ning importer “working” (read some of the other replies before and after the one I linked for more context). ooh, also… Am I getting this wrong but I’m not sure ‘Replies’ have post titles? Sorry, I’d edit my last post but I can’t see a way of doing that! Just an update on progress… So far I’ve managed to import a test batch of topics and they are all in the right place in the admin, however – when I view their parent forum on the front end they are not displaying. Topics I’ve created via the admin (Topics / Add New) seem to work fine but none of the imported Topics will display. I’ve even compared the tables in the DB but cant spot anything wrong there. Apologies for the late reply, importing alone will not add all the required “meta data” that bbPress requires, after importing your batch of test topics go to “Tools -> Forums” and run each of the bbPress repair tools, this should fix your issues of not seeing the topics on the front end. We managed to get the content imported (most of it anyway) using the thread you mentioned, thanks for that @netweb.